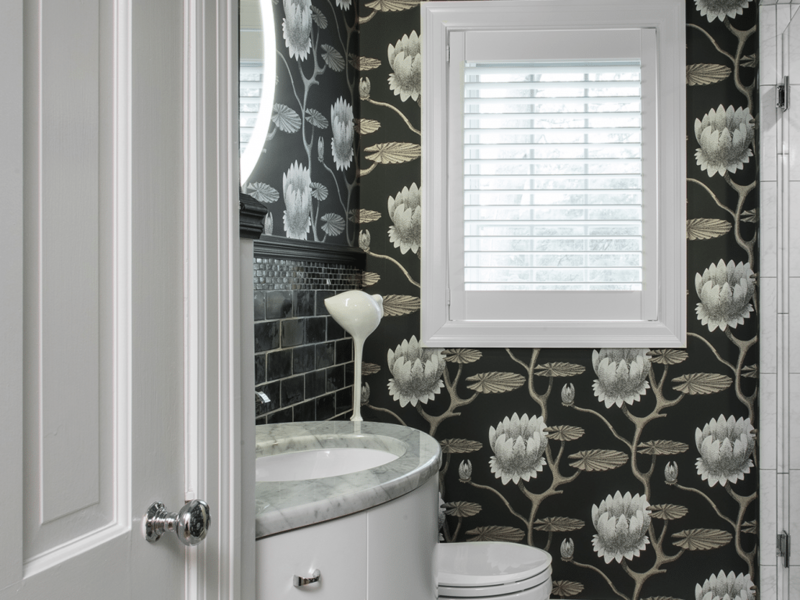 A small powder room is a perfect place to think big! 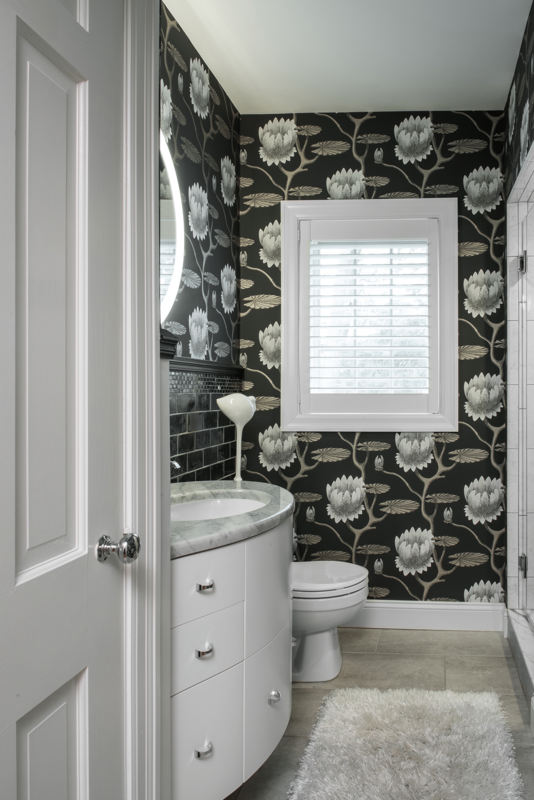 To set the glamorous tone our clients envisioned for this space, we wrapped the room in a large scale black and white floral wallpaper. 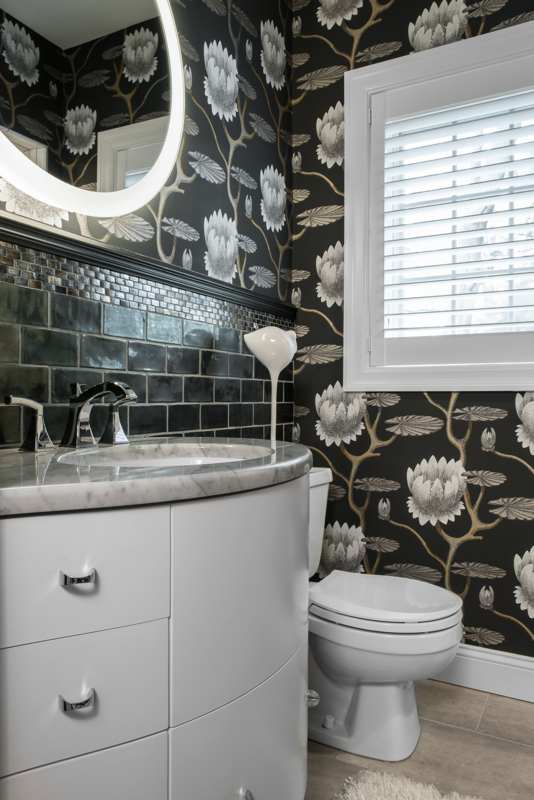 Layering iridescent black subway tiles topped by iridescent mosaics and a chair rail in iridescent black paint add flair and protect the wall from water splashes. 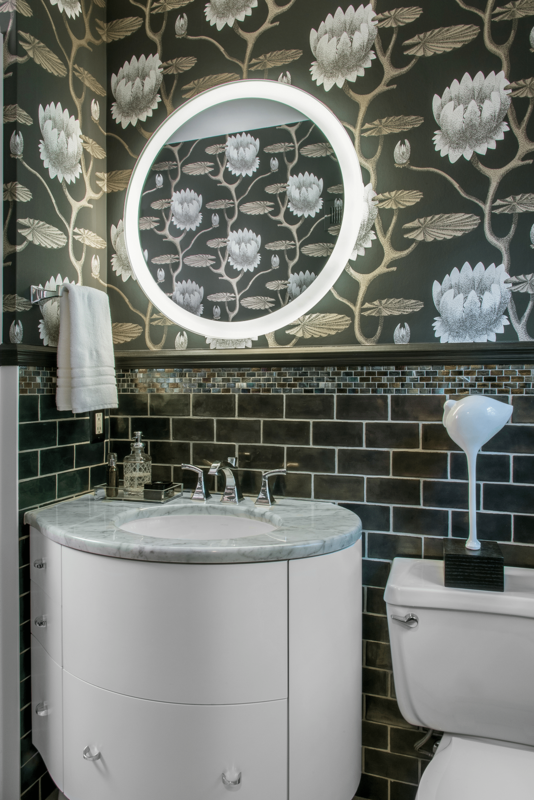 A curved vanity keeps the space from feeling crowded, and a round mirror with edge lighting eliminates the need for additional sconces, which would have felt cluttered on the dramatic wallpaper. “Marcia and I have worked on several projects over the past four to five years. 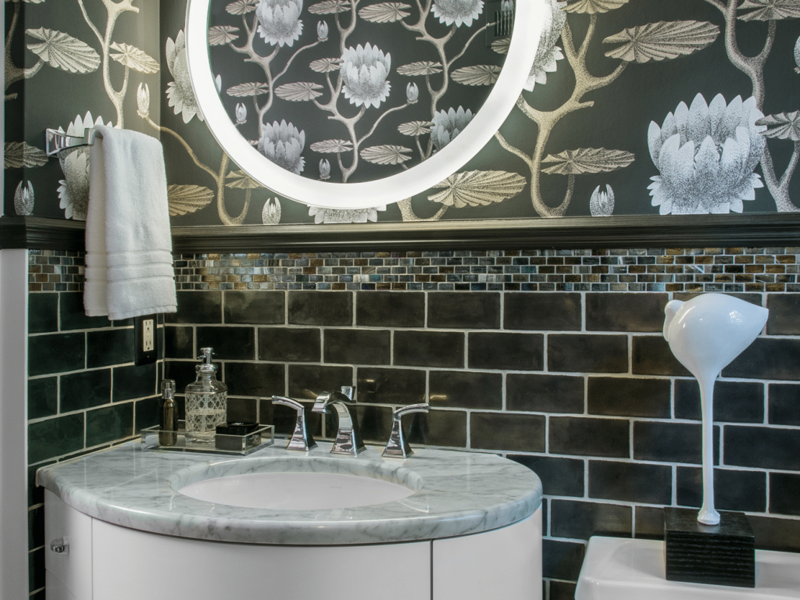 Most recently, she took on a total remodel of our 1940s pink bathroom and transformed it into a fabulous space. Fortunately, it was completed just before Christmas and got rave reviews from friends and family who could not believe their eyes! The workers she contracted were top notch, professional and respectful of the fact that we still had to live in the house during this major transformation. One of Marcia’s strengths is her ability to nudge you gently out of your comfort zone but still maintain your taste and vision. I have always felt that the finished product reflects that. Marcia saved me from many costly mistakes, and for that alone, I am grateful. 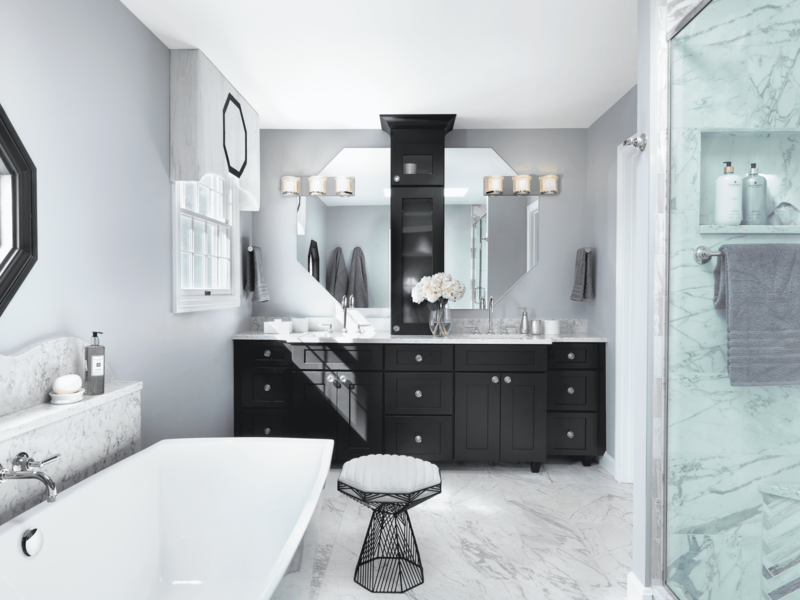 Probably the most important thing I have to say is that I love my home and especially the new bathroom, which makes me happy every time I step into the room or pass by.” — L.B.